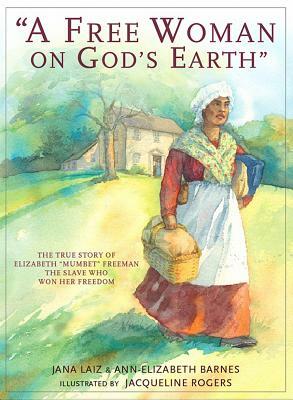 "A Free Woman On God's Earth" The True Story of Elizabeth "Mumbet" Freeman, The Slave Who WOn Her Freedom is the inspiring story of Mumbet, an enslaved African woman who lived in Sheffield, Massachusetts during Revolutionary War times. Owned by John and Hannah Ashley, Mumbet served eleven patriots as they wrote impassioned letters to King George demanding freedom from the British. Mumbet could not help but overhear their conversations. These Declaration of Greivances became the Sheffield Resolves, or the Sheffield Declaration, the precursor to the Declaration of Independence and the irony of the sentinments in this document was not lost on Mumbet. After a particularly brutal incident, where Mistress Hannah Ashley intends to strike a servant girl with a hot poker from the hearth, Mumbet puts her own arm up to block the blow and is burned to the bone. When she finally heals, she realizes she can no longer live enslaved and waits for the right moment. The moment comes in 1780 with the ratification of the Massachusetts Constitutuion, making into the law the words, "All men are created free and equal." Mumbet takes these words and used them to sue for her freedom. On AUgust 21, 1781, she becomes a free woman. Jana Laiz is the author of the triple award-winning novel, Weeping Under This Same Moon, Moonbeam Silver Medal Winner, The Twelfth Stone, Elephants of the Tsunami, the co-author of "A Free Woman On God's Earth, The True Story of Elizabeth "Mumbet" Freeman, The Slave Who Won Her Freedom" soon to be a feature film, Thomas & Autumn, Simon Says ~ Tails Told By The Red Lion Inn Ambassador and Billy Budd in the Breadbox, The Story of Herman Melville & Eleanor. A former refugee resettlement counselor and ESL teacher, Jana believes that honoring diversity can change the world. She is passionate about our beautiful planet and endeavors to make a difference in the world through her writing. She is the very first Writer-In-Residence at Herman Melville's beloved Arrowhead. Her new book, Blanket of Stars will be out summer 2019. She lives in the Berkshire Hills of Massachusetts. Ann-Elizabeth Barnes has been a storyteller since she was a child. She likes to put history in context so that it is simple to remember. And this is what she seeks to do – make history interesting and accessible.